This article is about volcanic mudflow. For other uses, see Lahar (disambiguation). A lahar travels down a river valley in Guatemala near the Santa Maria volcano, 1989. A lahar ( /ˈlɑːhɑːr/, from Javanese: ꦮ꧀ꦭꦲꦂ, translit. wlahar) is a violent type of mudflow or debris flow composed of a slurry of pyroclastic material, rocky debris and water. The material flows down from a volcano, typically along a river valley. Lahars are extremely destructive: they can flow tens of metres per second (22 mph or more), they have been known to be up to 140 metres (460 ft) deep, and large flows tend to destroy any structures in their path. They have even been known to decimate entire settlements. Notable lahars include those at Mount Pinatubo and Nevado del Ruiz, the latter of which killed thousands of people and caused extensive damage to infrastructure. The word lahar is of Javanese origin. The geological term was introduced by Berend George Escher in 1922. A lahar is a volcanic mudflow or debris flow. Lahars have the consistency, viscosity and approximate density of wet concrete: fluid when moving, solid at rest. Lahars can be huge. The Osceola Lahar produced by Mount Rainier (Washington) some 5600 years ago resulted in a wall of mud 140 metres (460 ft) deep in the White River canyon, which covered an area of over 330 square kilometres (130 sq mi), for a total volume of 2.3 cubic kilometres (0.55 cu mi). 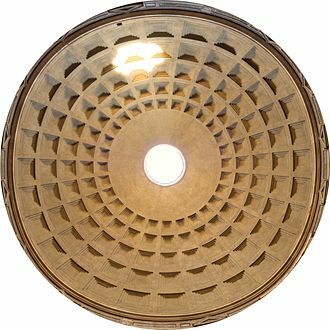 A lahar of sufficient size and intensity can erase virtually any structure in its path, and is capable of carving its own pathway, making the prediction of its course difficult. 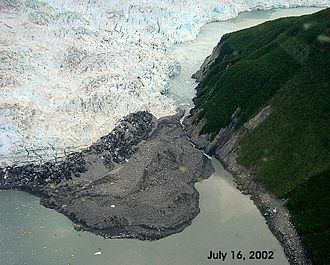 Conversely, a lahar quickly loses force when it leaves the channel of its flow: even frail huts may remain standing, while at the same time being buried to the roof line in mud. A lahar's viscosity decreases with time, and can be further thinned by rain, but it nevertheless solidifies quickly when coming to a stop. Lahars vary in size and speed. Small lahars less than a few metres wide and several centimetres deep may flow a few metres per second. Large lahars hundreds of metres wide and tens of metres deep can flow several tens of metres per second (22 mph or more): much too fast for people to outrun. With the potential to flow at speeds up to 100 kilometres per hour (60 mph), and flow distances of more than 300 kilometres (190 mi), a lahar can cause catastrophic destruction in its path. Lahars from the 1985 Nevado del Ruiz eruption in Colombia caused the Armero tragedy, which killed an estimated 23,000 people, when the city of Armero was buried under 5 metres (16 ft) of mud and debris. A lahar caused New Zealand's Tangiwai disaster, where 151 people died after a Christmas Eve express train fell into the Whangaehu River in 1953. Lahars have been responsible for 17% of volcano-related deaths between 1783 and 1997. A lahar can cause fatalities years after its precipitating eruption. 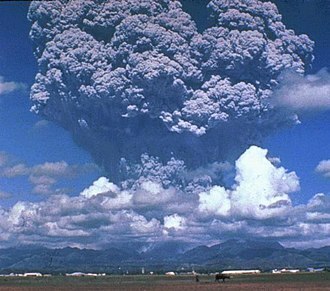 For example, the Cabalantian tragedy occurred four years subsequent to the 1991 eruption of Mount Pinatubo. Snow and glaciers can be melted by lava and/or pyroclastic surges during an eruption. Water from a crater lake, combined with volcanic elements in an eruption. Heavy rainfall on unconsolidated pyroclastic deposits. In particular, although lahars are typically associated with the effects of volcanic activity, lahars can occur even without any current volcanic activity, as long as the conditions are right to cause the collapse and movement of mud originating from existing volcanic ash deposits. Snow and glaciers can melt during periods of mild to hot weather. Earthquakes underneath or close to the volcano can shake material loose and cause it to collapse, triggering a lahar avalanche. Rainfall can cause the still-hanging slabs of solidified mud to come rushing down the slopes at a speed of more than 30 kilometres per hour (20 mph), causing devastating results. The aftermath of a lahar from the 1982 eruption of Galunggung, Indonesia. Several mountains in the world, including Mount Rainier in the United States, Mount Ruapehu in New Zealand, Merapi and Galunggung in Indonesia, are considered particularly dangerous due to the risk of lahars. 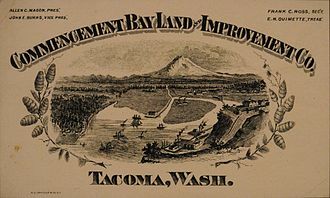 Several towns in the Puyallup River valley in Washington state, including Orting, are built on top of lahar deposits that are only about 500 years old. Lahars are predicted to flow through the valley every 500 to 1,000 years, so Orting, Sumner, Puyallup, Fife, and the Port of Tacoma face considerable risk. The USGS has set up lahar warning sirens in Pierce County, Washington, so that people can flee an approaching debris flow in the event of a Mount Rainier eruption. A lahar warning system has been set up at Mount Ruapehu by the New Zealand Department of Conservation and hailed as a success after it successfully alerted officials to an impending lahar on 18 March 2007. Since mid-June 1991, when violent eruptions triggered Mount Pinatubo's first lahars in 500 years, a system to monitor and warn of lahars has been in operation. Radio-telemetered rain gauges provide data on rainfall in lahar source regions, acoustic flow monitors on stream banks detect ground vibration as lahars pass, and manned watchpoints further confirm that lahars are rushing down Pinatubo's slopes. This system has enabled warnings to be sounded for most but not all major lahars at Pinatubo, saving hundreds of lives. Physical preventative measures by the Philippine government were not adequate to stop over 20 feet (6.1 m) of mud from flooding many villages around Mount Pinatubo from 1992 through 1998. Scientists and governments try to identify areas with a high risk of lahars based on historical events and computer models. Volcano scientists play a critical role in effective hazard education by informing officials and the public about realistic hazard probabilities and scenarios (including potential magnitude, timing, and impacts); by helping evaluate the effectiveness of proposed risk-reduction strategies; by helping promote acceptance of (and confidence in) hazards information through participatory engagement with officials and vulnerable communities as partners in risk reduction efforts; and by communicating with emergency managers during extreme events. An example of such a model is TITAN2D. These models are directed towards future planning: identifying low-risk regions to place community buildings, discovering how to mitigate lahars with dams, and constructing evacuation plans. 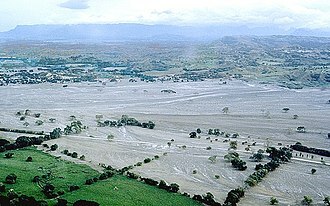 The lahar from the 1985 eruption of Nevado del Ruiz that wiped out the town of Armero in Colombia. 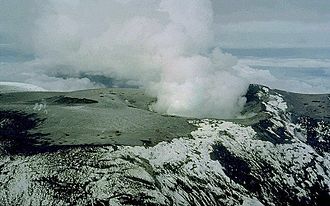 In 1985, the volcano Nevado del Ruiz erupted in central Colombia. As pyroclastic flows erupted from the volcano's crater, they melted the mountain's glaciers, sending four enormous lahars down its slopes at 60 kilometers per hour (40 miles per hour). The lahars picked up speed in gullies and coursed into the six major rivers at the base of the volcano; they engulfed the town of Armero, killing more than 20,000 of its almost 29,000 inhabitants. 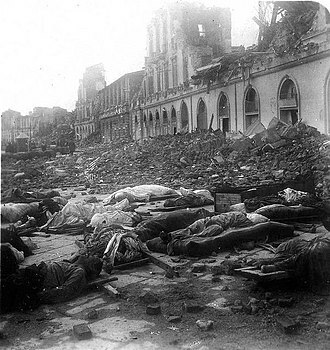 Casualties in other towns, particularly Chinchiná, brought the overall death toll to 23,000. Footage and photographs of Omayra Sánchez, a young victim of the tragedy, were published around the world. Other photographs of the lahars and the impact of the disaster captured attention worldwide and led to controversy over the degree to which the Colombian government was responsible for the disaster. A before-and-after photograph of a river valley filled in by lahars from Mount Pinatubo. The 1991 eruption of Mount Pinatubo caused lahar flows: the first eruption itself killed six people, but the lahar flows killed more than 1500. The eye of Typhoon Yunya passed over the volcano during its eruption on June 15, 1991. The rain from the typhoon triggered the flow of volcanic ash, boulders, and water down the rivers surrounding the volcano. In Pampanga, Angeles City and neighbouring cities and towns were damaged by the volcano's sticky lahar floods when Sapang Balen Creek and the Abacan River became the channels for the mudflows and carried it to the heart of the city and surrounding areas. Over 6 metres (20 ft) of mud inundated and damaged the towns of Castillejos, San Marcelino and Botolan in Zambales, Porac and Mabalacat City in Pampanga, Tarlac City, Capas, Concepcion and Bamban in Tarlac. The lahar floods down the Sacobia-Bamban River scoured all structures in its path, including the bridges and dikes by the Parua River in Concepcion. The Tarlac River in Tarlac City was inundated by over 6 metres (20 ft) of lahar, causing the river to lose the ability to hold water. On the morning of October 1, 1995, pyroclastic material which clung to the slopes of Pinatubo and surrounding mountains rushed down because of heavy rain, and turned into an 8-metre (25 ft) lahar flood. These mudflows killed hundreds of people in Barangay Cabalantian in Bacolor. The Philippine government under President Fidel V. Ramos ordered the construction of the FVR Mega Dike in an attempt to protect people from further mudflows. Another typhoon-volcano lahar hit the Philippines in 2006; see Typhoon Reming. ^ "Lahar". 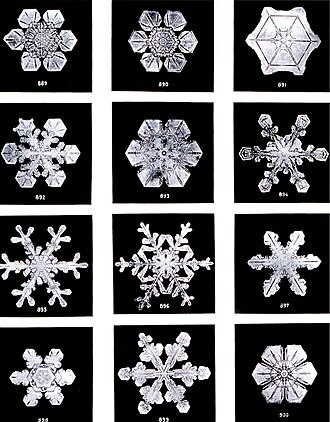 USGS Photo Glossary. Retrieved 2009-04-19. ^ Vallance, James W.; Iverson, Richard M. (2015-01-01). "Chapter 37 – Lahars and Their Deposits". In Sigurdsson, Haraldur. Encyclopedia of Volcanoes. Amsterdam: Academic Press. pp. 649–664. ISBN 978-0-12-385938-9. ^ Goudie, Andrew, ed. (2004). "Lahar by Vincent E. Neall". Encyclopedia of Geomorphology. vol. 2. pp. 597–599. ^ Gerrard, John (1990). Mountain Environments: An Examination of the Physical Geography of Mountains. MIT Press. p. 209. ISBN 978-0262071284. ^ a b c This article incorporates public domain material from the United States Geological Survey document: "Lahars and Their Effects". Retrieved 2012-08-23. ^ Crandell, D.R. (1971). "Post glacial lahars From Mount Rainier Volcano, Washington". U.S. Geological Survey Professional Paper. 677. ^ Hoblitt, R.P. ; Miller, C.D. ; Scott, W.E. (1987). "Volcanic Hazards with Regard to Siting Nuclear-Power Plants in the Pacific Northwest". U.S. Geological Survey Open-File Report. 87–297. ^ "Deadly Lahars from Nevado del Ruiz, Colombia". USGS Volcano Hazards Program. Archived from the original on 2007-08-24. Retrieved 2007-09-02. ^ "Lahars from Mt Ruapehu" (PDF). Department of Conservation (New Zealand). 2006. Retrieved 5 November 2016. ^ Tanguy, J.; et al. (1998). "Victims from volcanic eruptions: a revised database". Bulletin of Volcanology. 60 (2): 140. doi:10.1007/s004450050222. ^ Post, The Jakarta. "Lahar destroys farmlands". The Jakarta Post. Retrieved 2018-06-06. ^ Media, Kompas Cyber (2011-02-24). "Material Lahar Dingin Masih Berbahaya - Kompas.com". KOMPAS.com (in Indonesian). Retrieved 2018-06-06. ^ Pierson, Thomas C; Wood, Nathan J; Driedger, Carolyn L (2014-11-06). "Reducing risk from lahar hazards: concepts, case studies, and roles for scientists". Journal of Applied Volcanology. 3 (1). doi:10.1186/s13617-014-0016-4. ISSN 2191-5040. ^ Schuster, Robert L.; Highland, Lynn M. (2001). "Socioeconomic and Environmental Impacts of Landslides in the Western Hemisphere". U.S. Geological Survey. Open-File Report 01-0276. Retrieved June 11, 2010. Wikimedia Commons has media related to Lahars. Look up lahar in Wiktionary, the free dictionary. A valley is a low area between hills, often with a river running through it. In geology, a valley or dale is a depression that is longer than it is wide, the terms U-shaped and V-shaped are descriptive terms of geography to characterize the form of valleys. Most valleys belong to one of two main types or a mixture of them, with respect to the cross section of the slopes or hillsides. A valley in its broadest geographic sense is known as a dale. A valley through which a river runs may be referred to as a vale, a small and often wooded valley is known as a dell or in Scotland as a glen. A wide, flat valley through which a river runs is known in Scotland as a strath, a mountain cove is a small valley, closed at one or both ends, in the central or southern Appalachian Mountains which sometimes results from the erosion of a geologic window. A small valley surrounded by mountains or ridges is sometimes known as a hollow, a deep, narrow valley is known as a cwm. 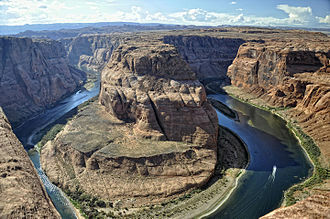 Similar geological structures, such as canyons, gorges, chines, a valley formed by erosion is called an erosional valley, a valley formed by geologic events such as drop faults or the rise of highlands is called a structural valley. A valley formed by flowing water, or river valley, is usually V-shaped, the exact shape will depend on the characteristics of the stream flowing through it. Rivers with steep gradients, as in mountain ranges, produce steep walls, shallower slopes may produce broader and gentler valleys. However, in the lowest stretch of a river, where it approaches its base level, it begins to deposit sediment, in prehistory, the rivers were used as a source of fresh water and food, as well as a place to wash and a sewer. The proximity of water moderated temperature extremes and provided a source for irrigation, most of the first civilizations developed from these river valley communities. In geography, a vale is a river valley, usually with a particularly wide flood plain or flat valley bottom. In Southern England, vales commonly occur between the escarpment slopes of pairs of chalk formations, where the dome has been eroded, exposing less resistant underlying rock. Rift valleys, such as the Albertine Rift, are formed by the expansion of the Earths crust due to tectonic activity beneath the Earths surface, there are various forms of valley associated with glaciation that may be referred to as glacial valleys. A valley carved by glaciers is normally U-shaped, the valley becomes visible upon the recession of the glacier that forms it. Water is a transparent and nearly colorless chemical substance that is the main constituent of Earths streams and oceans, and the fluids of most living organisms. Its chemical formula is H2O, meaning that its molecule contains one oxygen, Water strictly refers to the liquid state of that substance, that prevails at standard ambient temperature and pressure, but it often refers to its solid state or its gaseous state. It occurs in nature as snow, ice packs and icebergs, fog, aquifers, Water covers 71% of the Earths surface. It is vital for all forms of life. Only 2. 5% of this water is freshwater, and 98. 8% of that water is in ice and groundwater. Less than 0. 3% of all freshwater is in rivers and the atmosphere, a greater quantity of water is found in the earths interior. Water on Earth moves continually through the cycle of evaporation and transpiration, precipitation. Evaporation and transpiration contribute to the precipitation over land, large amounts of water are chemically combined or adsorbed in hydrated minerals. Safe drinking water is essential to humans and other even though it provides no calories or organic nutrients. There is a correlation between access to safe water and gross domestic product per capita. However, some observers have estimated that by 2025 more than half of the population will be facing water-based vulnerability. A report, issued in November 2009, suggests that by 2030, in developing regions of the world. Water plays an important role in the world economy, approximately 70% of the freshwater used by humans goes to agriculture. Fishing in salt and fresh water bodies is a source of food for many parts of the world. 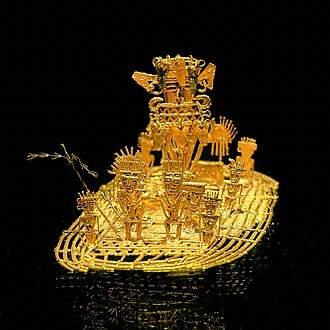 Much of long-distance trade of commodities and manufactured products is transported by boats through seas, lakes, large quantities of water and steam are used for cooling and heating, in industry and homes. Water is an excellent solvent for a variety of chemical substances, as such it is widely used in industrial processes. 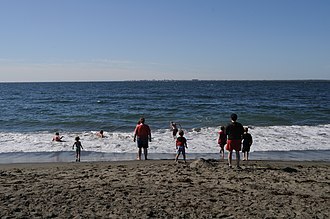 Water is central to many sports and other forms of entertainment, such as swimming, pleasure boating, boat racing, sport fishing, Water is a liquid at the temperatures and pressures that are most adequate for life. 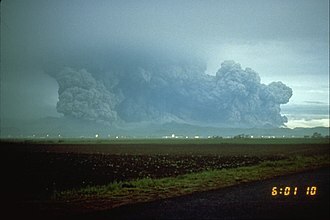 On May 18,1980, a major volcanic eruption occurred at Mount St. Helens, a volcano located in Skamania County, in the state of Washington, United States. The eruption was the significant volcanic eruption to occur in the contiguous 48 U. S. states since the 1915 eruption of Lassen Peak in California. However, it has often declared as the most disastrous volcanic eruption in United States history. An earthquake at 8,32,17 a. m. PDT on Sunday, May 18,1980, caused the entire weakened north face to slide away, creating the largest landslide ever recorded. 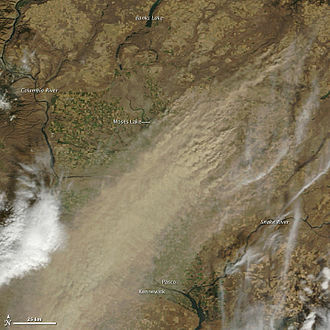 An eruption column rose 80,000 feet into the atmosphere, at the same time, snow and several entire glaciers on the volcano melted, forming a series of large lahars that reached as far as the Columbia River, nearly 50 miles to the southwest. Less severe outbursts continued into the day, only to be followed by other large. Approximately fifty-seven people were killed directly, including innkeeper Harry R. Truman, photographer Reid Blackburn and geologist David A.
Johnston. 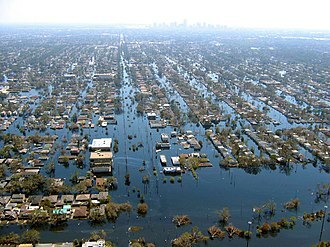 Hundreds of square miles were reduced to wasteland, causing over a billion U. S. dollars in damage, thousands of animals were killed. 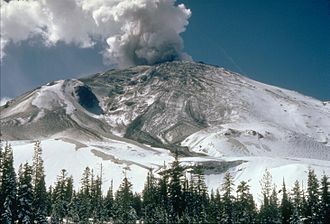 At the time of the eruption, the summit of the volcano was owned by the Burlington Northern Railroad, the area was preserved, as it was, in the Mount St. Helens National Volcanic Monument. Mount St. Helens remained dormant from its last period of activity in the 1840s and 1850s until March 1980, several small earthquakes, apparently beginning on March 15, indicated that magma may have begun moving below the volcano. Then on March 20, at 3,45 p. m. Pacific Standard Time, a total of 174 shocks of magnitude 2.6 or greater were recorded during those two days. Initially there was no sign of eruption, but small earthquake-induced avalanches of snow. At 12,36 p. m. on March 27, phreatic eruptions ejected and smashed rock from within the old crater, excavating a new crater 250 feet wide. By this date a 16, 000-foot long eastward-trending fracture system had developed across the summit area. The United States Geological Survey is a scientific agency of the United States government. The scientists of the USGS study the landscape of the United States, its resources. The organization has four science disciplines, concerning biology, geology. The USGS is a research organization with no regulatory responsibility. The USGS is a bureau of the United States Department of the Interior, the USGS employs approximately 8,670 people and is headquartered in Reston, Virginia. The USGS has major offices near Lakewood, Colorado, at the Denver Federal Center, the current motto of the USGS, in use since August 1997, is science for a changing world. The agencys previous slogan, adopted on the occasion of its anniversary, was Earth Science in the Public Service. Prompted by a report from the National Academy of Sciences, the USGS was created, by a last-minute amendment and it was charged with the classification of the public lands, and examination of the geological structure, mineral resources, and products of the national domain. This task was driven by the need to inventory the vast lands added to the United States by the Louisiana Purchase in 1803, the legislation provided that the Hayden and Wheeler surveys be discontinued as of June 30,1879. Clarence King, the first director of USGS, assembled the new organization from disparate regional survey agencies, after a short tenure, King was succeeded in the directors chair by John Wesley Powell. Administratively, it is divided into a Headquarters unit and six Regional Units, Other specific programs include, Earthquake Hazards Program monitors earthquake activity worldwide. The National Earthquake Information Center in Golden, Colorado on the campus of the Colorado School of Mines detects the location, the USGS runs or supports several regional monitoring networks in the United States under the umbrella of the Advanced National Seismic System. The USGS informs authorities, emergency responders, the media, and it maintains long-term archives of earthquake data for scientific and engineering research. 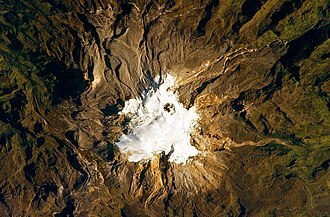 The Armero tragedy was one of the major consequences of the eruption of the Nevado del Ruiz stratovolcano in Tolima, Colombia, on November 13,1985. As pyroclastic flows erupted from the crater, they melted the mountains glaciers. 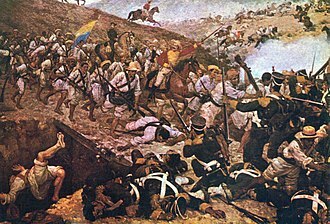 The lahars picked up speed in gullies and coursed into the six major rivers at the base of the volcano, they engulfed the town of Armero, casualties in other towns, particularly Chinchiná, brought the overall death toll to 23,000. Footage and photographs of Omayra Sánchez, a victim of the tragedy, were published around the world. Other photographs of the lahars and the impact of the disaster captured attention worldwide, a banner at a mass funeral in Ibagué read, The volcano didnt kill 22,000 people. The relief efforts were hindered by the composition of the mud, by the time relief workers reached Armero twelve hours after the eruption, many of the victims with serious injuries were dead. The relief workers were horrified by the landscape of trees, disfigured human bodies. This was the second-deadliest volcanic disaster of the 20th century, surpassed only by the 1902 eruption of Mount Pelée, Hazard maps for the vicinity were prepared, but poorly distributed. On the day of the eruption, several attempts were made. Many victims stayed in their houses as they had been instructed, the noise from the storm may have prevented many from hearing the sounds from Ruiz until it was too late. Nevado del Ruiz has erupted several times since the disaster, and continues to threaten up to 500,000 people living along the Combeima, Coello-Toche, and Guali river valleys. A lahar similar in size to the 1985 event could potentially travel as far as 100 kilometers from the volcano, to counter this threat, the Colombian government established a specialized office which promotes awareness of natural threats. Additionally, many of Colombias cities have programs to awareness of natural disaster planning programs which have helped save lives in natural disasters. Near Nevado del Ruiz in particular, locals have become wary of volcanic activity, located 48 kilometers from the Nevado del Ruiz volcano and 169 kilometers from Colombias capital of Bogotá, was the third largest town in Tolima Department, after Ibagué and Espinal. It is a stratovolcano, composed of many layers of lava alternating with hardened volcanic ash and other pyroclastic rocks. Nevado del Ruiz has been active for two million years, since the early Pleistocene or late Pliocene epoch, with three major eruptive periods. The current volcanic cone formed during the present eruptive period, which began 150 thousand years ago, the volcano usually generates Plinian eruptions, which produce swift-moving currents of hot gas and rock called pyroclastic flows. These eruptions often cause massive lahars, which pose a threat to human life, the impact of such an eruption is increased as the hot gas and lava melt the mountains snowcap, adding large quantities of water to the flow. On November 13,1985, a small eruption produced an enormous lahar that buried and destroyed the town of Armero in Tolima and this event became known as the Armero tragedy—the deadliest lahar in recorded history. Similar but less deadly incidents occurred in 1595 and 1845, consisting of an explosive eruption followed by a large lahar. The volcano is part of Los Nevados National Natural Park, which contains several other volcanoes. The summit of Nevado del Ruiz is covered by large glaciers, the volcano continues to pose a threat to the nearby towns and villages, and it is estimated that up to 500,000 people could be at risk from lahars from future eruptions. 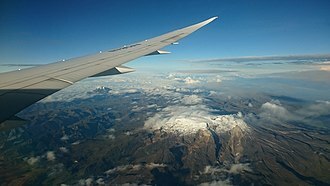 Nevado del Ruiz, which lies about 129 kilometers west of Bogotá, is part of the Andes mountain range, the volcano is part of the Ruiz–Tolima volcanic massif, a group of five ice-capped volcanoes which includes the Tolima, Santa Isabel and Machin volcanoes. The massif is located at the intersection of four faults, some of which still are active, Nevado del Ruiz lies within the Pacific Ring of Fire, a region that encircles the Pacific Ocean and contains some of the worlds most active volcanoes. It is the third most northerly of the lying in the North Volcanic Zone of the Andean Volcanic Belt. The Andean Volcanic Belt is produced by the subduction of the oceanic Nazca Plate beneath the South American continental plate. A glacier is a persistent body of dense ice that is constantly moving under its own weight, it forms where the accumulation of snow exceeds its ablation over many years, often centuries. 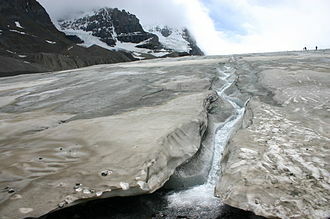 Glaciers slowly deform and flow due to stresses induced by their weight, creating crevasses and they abrade rock and debris from their substrate to create landforms such as cirques and moraines. Glaciers form only on land and are distinct from the much thinner sea ice, between 35°N and 35°S, glaciers occur only in the Himalayas, Rocky Mountains, a few high mountains in East Africa, New Guinea and on Zard Kuh in Iran. Glaciers cover about 10 percent of Earths land surface, continental glaciers cover nearly 13,000,000 km2 or about 98 percent of Antarcticas 13,200,000 km2, with an average thickness of 2,100 m. Greenland and Patagonia have huge expanses of continental glaciers, Glacial ice is the largest reservoir of fresh water on Earth. Within high altitude and Antarctic environments, the temperature difference is often not sufficient to release meltwater. A large piece of compressed ice, or a glacier, appears blue as large quantities of water appear blue and this is because water molecules absorb other colors more efficiently than blue. The other reason for the color of glaciers is the lack of air bubbles. Air bubbles, which give a color to ice, are squeezed out by pressure increasing the density of the created ice. The word Glaceon is a loanword from French and goes back, via Franco-Provençal, to the Vulgar Latin glaciārium, derived from the Late Latin glacia, the processes and features caused by or related to glaciers are referred to as glacial. The process of establishment and flow is called glaciation. The corresponding area of study is called glaciology, Glaciers are important components of the global cryosphere. Glaciers are categorized by their morphology, thermal characteristics, and behavior, cirque glaciers form on the crests and slopes of mountains. A glacier that fills a valley is called a valley glacier, a large body of glacial ice astride a mountain, mountain range, or volcano is termed an ice cap or ice field. Ice caps have a less than 50,000 km2 by definition. 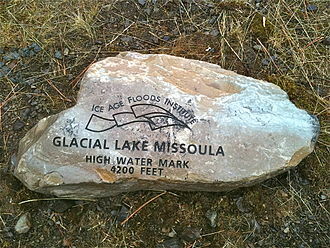 Glacial bodies larger than 50,000 km2 are called ice sheets or continental glaciers, several kilometers deep, they obscure the underlying topography. 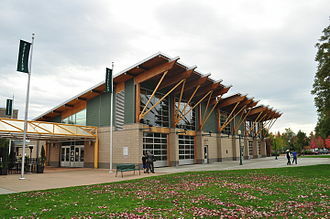 Pierce County is a county in the U. S. state of Washington. 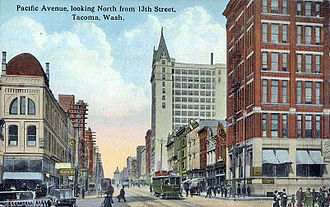 As of the 2010 Census, the population was 795,225, the county seat and largest city is Tacoma. 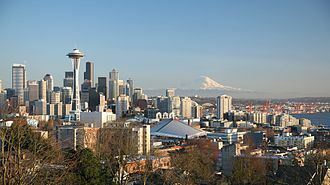 Formed out of Thurston County on December 22,1852, by the legislature of Oregon Territory, Pierce County is in the Seattle metropolitan area. 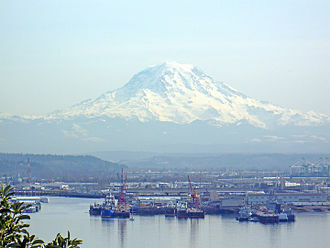 Pierce County is notable for being home to Mount Rainier, the tallest mountain and its most recent recorded eruption was between 1820 and 1854. There is no imminent risk of eruption, but geologists expect that the volcano will erupt again, if this should happen, parts of Pierce County and the Puyallup Valley would be at risk from lahars, lava, or pyroclastic flows. 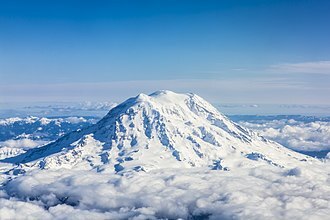 The Mount Rainier Volcano Lahar Warning System was established in 1998 to assist in the evacuation of the Puyallup River valley in case of eruption. According to the U. S. Census Bureau, the county has an area of 1,806 square miles. 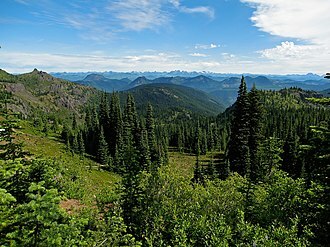 The highest natural point in Washington, Mount Rainier at 14,410 feet, is located in Pierce County, Pierce County contains the Clearwater Wilderness area. The population density was 417 people per square mile, there were 277,060 housing units at an average density of 165 per square mile. The racial makeup of the county was 78. 39% White,6. 95% Black or African American,1. 42% Native American,5. 08% Asian,0. 85% Pacific Islander,2. 20% from other races, and 5. 11% from two or more races. 5. 51% of the population were Hispanic or Latino of any race,16. 1% were of German,8. 6% Irish,8. 2% English,6. 3% United States or American and 6. 2% Norwegian ancestry according to the 2000 census. 24. 30% of all households were made up of individuals and 7. 60% had someone living alone who was 65 years of age or older, the average household size was 2.60 and the average family size was 3.10. In the county, the population was out with 27. 20% under the age of 18,9. 80% from 18 to 24,31. 30% from 25 to 44,21. 50% from 45 to 64. The median age was 34 years, for every 100 females there were 98.90 males. For every 100 females age 18 and over, there were 96.70 males, the median income for a household in the county was $45,204, and the median income for a family was $52,098. A volcano is a rupture in the crust of a planetary-mass object, such as Earth, that allows hot lava, volcanic ash, and gases to escape from a magma chamber below the surface. Earths volcanoes occur because its crust is broken into 17 major, therefore, on Earth, volcanoes are generally found where tectonic plates are diverging or converging. This type of volcanism falls under the umbrella of plate hypothesis volcanism, Volcanism away from plate boundaries has been explained as mantle plumes. These so-called hotspots, for example Hawaii, are postulated to arise from upwelling diapirs with magma from the boundary,3,000 km deep in the Earth. Volcanoes are usually not created where two plates slide past one another. Erupting volcanoes can pose hazards, not only in the immediate vicinity of the eruption. 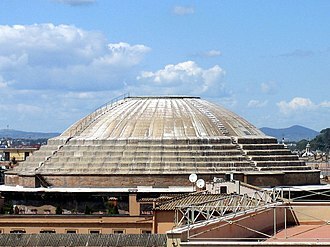 Historically, so-called volcanic winters have caused catastrophic famines, the word volcano is derived from the name of Vulcano, a volcanic island in the Aeolian Islands of Italy whose name in turn comes from Vulcan, the god of fire in Roman mythology. The study of volcanoes is called volcanology, sometimes spelled vulcanology, at the mid-oceanic ridges, two tectonic plates diverge from one another as new oceanic crust is formed by the cooling and solidifying of hot molten rock. Most divergent plate boundaries are at the bottom of the oceans, most volcanic activity is submarine, black smokers are evidence of this kind of volcanic activity. Where the mid-oceanic ridge is above sea-level, volcanic islands are formed, for example, subduction zones are places where two plates, usually an oceanic plate and a continental plate, collide. 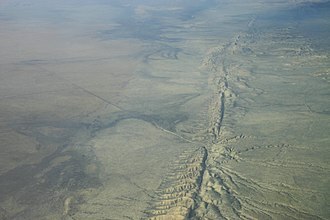 In this case, the plate subducts, or submerges under the continental plate forming a deep ocean trench just offshore. In a process called flux melting, water released from the subducting plate lowers the temperature of the overlying mantle wedge. This magma tends to be very viscous due to its high content, so it often does not reach the surface. When it does reach the surface, a volcano is formed, typical examples of this kind of volcano are Mount Etna and the volcanoes in the Pacific Ring of Fire. Debris flow channel with deposits left after 2010 storms in Ladakh, NW Indian Himalaya. Note coarse bouldery levees on both sides of the channel, and poorly sorted rocks on the channel floor. Scars formed by debris flow in Ventura, greater Los Angeles during the winter of 1983. The photograph was taken within several months of the debris flows occurring. Ancient debris flow deposit, Resting Springs Pass, California. Another debris flow in Ladakh, triggered by storms in 2010. Note poor sorting and levees. Steep source catchment is visible in background. Cordillera de Apaneca volcanic range in El Salvador. The country is home to 170 volcanoes, 23 which are active, including two calderas, one being a supervolcano. El Salvador has earned the epithets endearment La Tierra de Soberbios Volcanes, (The Land of Magnificent Volcanoes). Pinatubo in April 1991, a few months before the eruption. The eruption cloud a few minutes after the start of the climactic eruption. 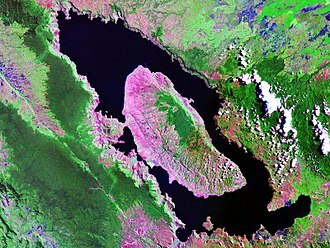 The summit caldera as seen on Aug. 1, 1991. The summit of Nevado del Ruiz in late November 1985. Armero was located in the center of this photograph, taken in late November 1985. 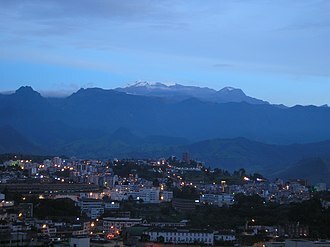 Nevado del Ruiz seen from Manizales, 2006. Kotagede, former capital of the Mataram Sultanate. This image shows some of the instruments deployed by the Deep Carbon Degassing Project in the vicinity of Mount Merapi in 2014. Merapi in July 2005. The constant smoke from its summit is said to come from two sacred armourers living under the mountain. Aerial photograph of Mount Rainier's western slope. 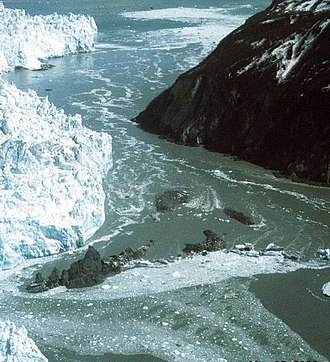 Hubbard Glacier, Alaska, squeezes towards Gibert Point on 20 May 2002. The glacier is close to sealing off Russell Fjord (top) from Disenchantment Bay (below). 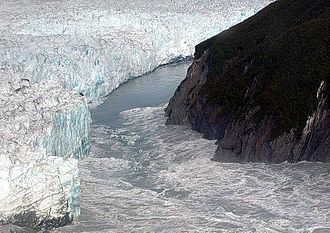 The Hubbard Glacier is overwhelmed on 14 August 2002 in the second largest GLOF in historical times. Ash cloud from the 2008 eruption of Chaitén volcano, Chile, stretching across Patagonia from the Pacific to the Atlantic Ocean. Ash plume rising from Eyjafjallajökull on April 17, 2010. Volcanic ash deposits on a parked McDonnell-Douglas DC-10-30 during the 1991 eruption of Mount Pinatubo, causing the aircraft to rest on its tail. While falling ash behaves in a similar manner to snow, the sheer weight of deposits can cause serious damage to buildings and vehicles, as seen here, where the deposits were able to cause the 120 ton airliner's centre of gravity to shift. Volcanic ash grain size distributions. 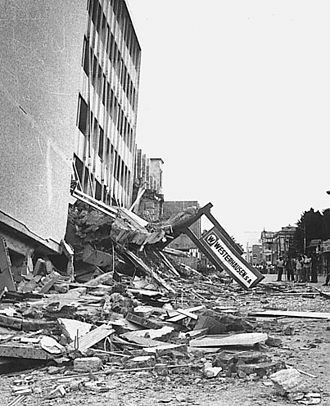 Collapsed Gran Hotel building in the San Salvador metropolis, after the shallow 1986 San Salvador earthquake. Fresh lahar channels scar Ruapehu's eastern slopes, 2007. 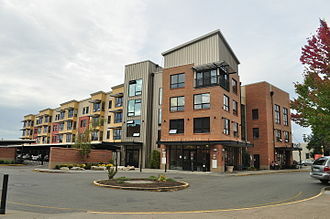 A modern condominium project near Pioneer Park. East side of 100 block of S. Meridian; in foreground, an antique shop in a former J.C. Penney. The volcano’s summit and upper flanks are covered by several glaciers that appear as a white mass surrounding the Arenas crater. The dry gravel bed of the White River floodplain near the campground in Mount Rainier National Park. The White River exhibits braided river and meander behavior with coarse woody debris deposited on extensive gravel bars. Populus trichocarpa, with its brilliant yellow fall foliage, grows alongside in the Abies amabilis forest. A lahar from the 1982 eruption of Galunggung.